What started last year as the new kid on the block, is now looking more and more like an established racing series already. 14 cars have registered for the whole season and some very well known teams from Europe are participating. Lechner Racing from Austria will participate with four cars, as will Provily Racing from Holland. Scuderia Nordica from Estland has two cars while Stuart Racing from Holland has three. A new team with one car has joined the series, Piro Sports from Germany. Still, not all the entries have been made and a couple more should join the series shortly. And for some races, like last year, teams of the Nordic 1.6 championship will also join. The young drivers come from many countries: Holland, Germany, Belgium, Luxembourg, Hungary, Sweden, Estonia and even from Australia. The Formula Renault 1.6 NEC Junior series is, after karting, the first step for many young drivers towards a career in single seaters. The series is organised by MdH Communications, which also is the organiser of the Formula Renault 2.0 Northern European Cup as well as the Clio Cup Benelux. The FR1.6 NEC Junior series has the same calendar as the Clio Cup Benelux which will bring them ao with the World Series by Renault to the famous circuits of Spa and the Nürburgring. The FR2.0 NEC series will join the two series in Assen, which will be the opportunity for the young talented FR1.6 drivers to show their talent. Next week the first official testsessions will be held in Assen (27/29 March) and Zandvoort (31 March) in Holland. The race weekend consists of two periods of 30 minutes free practice, 20 minutes of qualifying and two 20 minutes races. 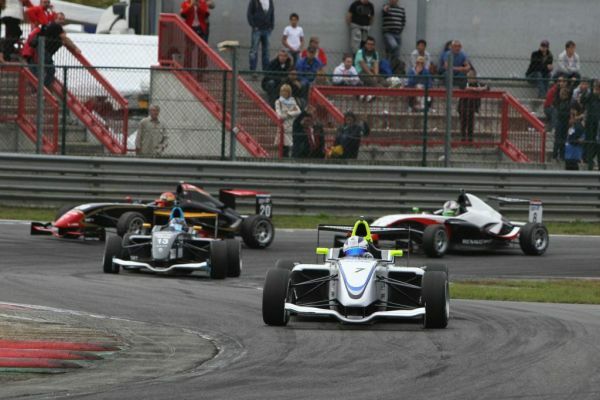 A third race is added to the last weekend of the season at Zandvoort.